In today's dynamic health care environment, medical assistants are playing an increasingly important role. 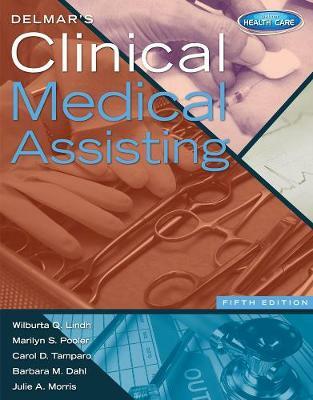 DELMAR'S CLINICAL MEDICAL ASSISTING, Fifth Edition, helps you gain the knowledge and skills needed to succeed in this rewarding, rapidly growing field. Known for its thorough coverage, extensive technical detail, and accurate, up-to-date content, this proven book covers clinical tasks such as taking patients' medical histories, recording vital signs, explaining procedures, and assisting care providers during exams, as well as administrative duties including managing patient information, electronic medical records (EMR), insurance documentation, billing, and bookkeeping. In addition, chapter material and learning objectives are clearly mapped to ABHES, CAAHEP, and MAERB competencies to help you hone practical, real-world skills and prepare for certification. The guide also supports effective learning with a variety of online resources to help you make the most of your study time, including interactive quizzes for self-assessment and the popular Critical Thinking Challenge application.